We have a new expression in my household: “WWIRD” (“What would Instructor Revolution do?”). It’s a little bit tongue-in-cheek, but also reflects our genuine appreciation for the no-nonsense attitudes expressed by Kelly Muir in her book. Here’s how it might come up: I’ll be doing some reading, or pondering various ways we might streamline or improve operations at the dojo. We are a two-dojo family, my husband having operated a school for 30-plus years, and I for the past 20, so it’s natural to look for ways to keep things fresh and think about whether we’re doing the best we can do. And I’ll notice that a lot of people in the “industry” are doing this or that at their schools—often something we’ve rejected doing in the past—so I’ll ask, is there something in it worth adapting or putting to use? To which my husband will reply, WWIRD? And half the time I’ll laugh, realizing I just recently read—and agreed with—Kelly Muir’s take on a similar subject; enough said. It’s like having a hard-nosed conscience. Instructor Revolution sets out to be provocative, but it’s hard to be provoked by an author with whom I share so many opinions. I was struck by how many of my own pet peeves she expresses throughout the book—and some of them are things I wasn’t sure anyone else cared about: for example, those ridiculous dances football players do when they score or make a play (Muir: “Isn’t that their job? I can’t imagine doing a victory dance every time I did something that was expected of me at work.”); the motivation and depth of knowledge that’s lost when students use video in place of live instruction (“…with the ease of learning kata online, the regard for it is beginning to wane.”); and the pressure on instructors to fatten their curricula with non-martial-arts content, social activism, and more, when we could be focusing on the value inherent in the training itself (“When a child only has a limited amount of time [to] dedicate to their training, I would prefer they spend it on their training.” Yes.). Then there are the larger issues, like the “self-esteem myth,” as she calls it: the idea that a child gains self-esteem through constant praise rather than genuine achievement—a subject that has come up often on this blog (here’s one example). 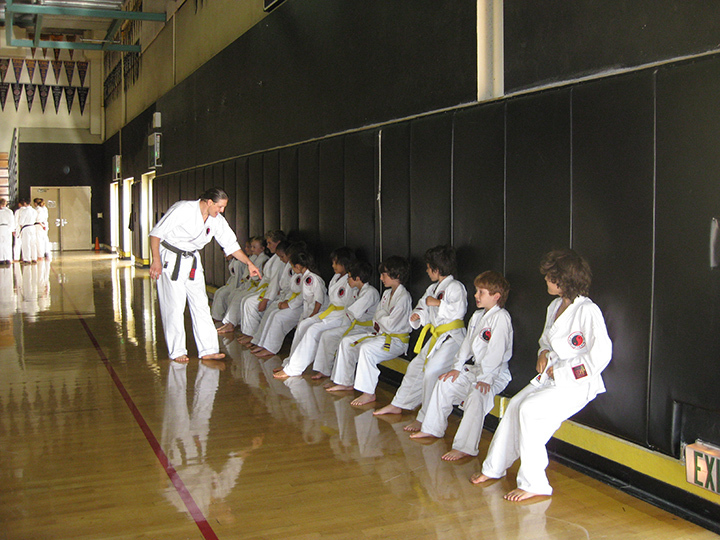 And the trend among instructors and school owners to try to boost retention of young students via rewards and gimmicks, generally making things fun and easy, when the real value of martial arts training (through a traditionalist’s eye) comes from the fact that it’s challenging and demanding. And I certainly agree that children are capable of meeting very high demands. In fact I agree with so much in the book, it’s hard for me to find it revolutionary. A great many of us in martial arts have been quietly teaching on these principles for decades; there’s nothing new about them. Even among colleagues who have adopted “industry” practices on the business side of the dojo, and adapted some popular material and drills into their children’s programs, many have maintained their basic, traditional principles throughout. To us, the title of the book seems overblown. 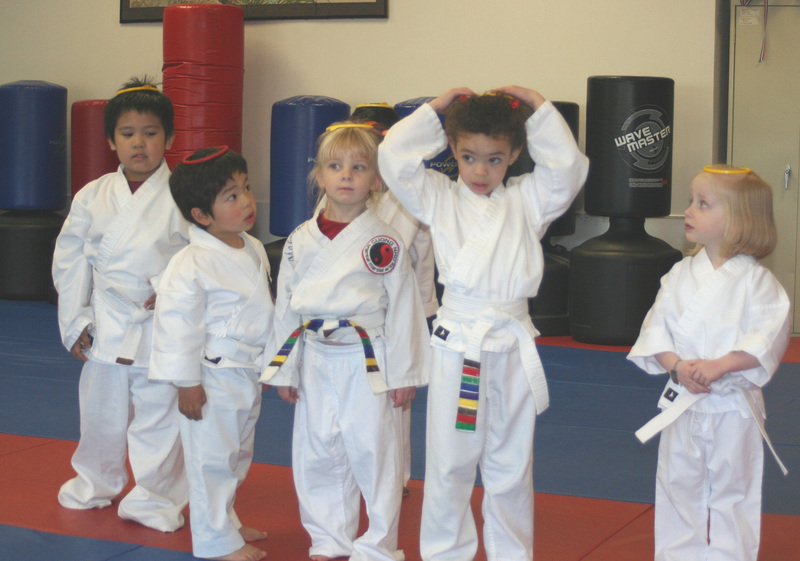 Instructor Revolution: a superior method of teaching children martial arts. That’s pure marketing copy. The first time I saw it, I thought, “If they have to say it’s superior, it probably isn’t.” (Of course, now that I’ve realized how close it is to my own thinking, I have to admit it is superior!) But Muir is a once-and-again figure within the “industry,” and it’s really within that context that she positions herself as revolutionary. In addition, her years in the business world as a corporate trainer have given her a certain gift for abbreviations and jargon. An IR™ instructor at TKCC can be expected to utilize CLM, layering, sealing, door-to-the-floor, and more (all, by the way, perfectly sensible concepts when they’re laid out). Reference to ‘IR instructors’ and that little ‘tm’ make it clear she’s packaging this as a system suitable for sale or franchise—just like the systems and products she’s revolting against. Not that there’s anything wrong with that! It’s a good book, well worth buying even if you don’t care about “industry” bandwagons. Its greatest value is for instructors who are looking to create a new children’s program, or who want to evaluate and fine-tune their current one. Muir provides a step-by-step program development guide that can help anyone evaluate and strengthen what they’re doing. It is style-neutral, and doesn’t at all depend on your agreeing with everything she says about working with kids. It’s quite thorough and thought-provoking, asking instructors to consider the “what, when and why” of their curriculum in a way martial artists who have inherited or adopted a traditional system too often don’t ask. Or visit Kelly Muir’s blog here. A young student approached me today to ask when his belt test was going to be scheduled. He’d been scheduled to test before the holiday break, but became ill and missed a week of classes, then a couple weeks more over the holidays… He figured a new test date was due, now that he was back. 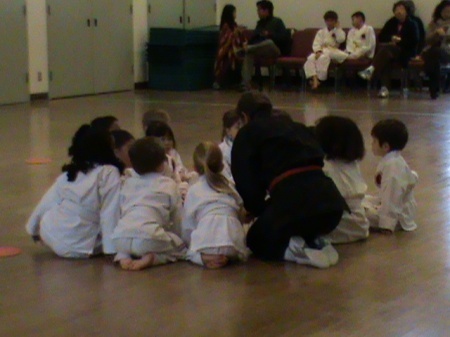 Like many (if not most) kids, he’s very focused on getting that stripe or belt. Normally, when a student misses a test date, I’ll schedule a make-up asap, but sometimes this doesn’t work out. This young man hadn’t kept up his skills during his absence, and when I ran him through the basics at the first class of the year – expecting to check off his test requirements one by one – I discovered he just didn’t know his stuff. 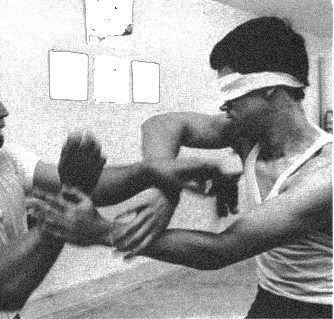 He didn’t recognize the names of basic techniques we practice every class, and he couldn’t show the difference between lunge punch and reverse punch. When I scheduled him to test back in December, he was able to do these things. Clearly, he had lost ground during the time off. It happens, and when it does, we get to work. I put him (and the other white belts) through their paces repeatedly during class, covering the 1-yellow-stripe techniques and stressing the importance of focusing on these basics before trying to copy the advanced kids or learn new things. Today I ran through the list again, and again he wasn’t ready. So, here he came after class, asking why he hadn’t gotten a new test date yet. I told him that, as much as I wanted him to get his stripe, when I looked at his basics, I didn’t feel he was ready. I pointed out the difficulty he’d had with lunge punch and reverse punch, and with performing the lower block correctly. (This is a child who is old enough to do these things well.) He looked disappointed, as is to be expected; but more than that – he looked shocked, as though it hadn’t occurred to him there was a connection between what we were doing in class, and what stripes he would get on his belt. I assured him that he would get his date as soon as I saw him getting the basics back up to where they’d been in December. He continued to look surprised. Instructors – How do you help your young students understand the connection between effort and reward? Please share some of your favorite lessons and strategies. Instructors: What tricks do you use to make the workout fun? I don’t mean “playing games” so much as making a regular workout seem like a game, or giving it an aspect that keeps kids engaged through many necessary repetitions. Class proceeds by letting a student draw a card, and having the whole class perform the repetitions suggested by the card. 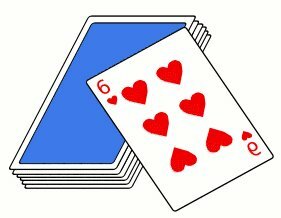 For example, if the first card drawn is nine of spades, I’ll choose a kick, and we’ll do a count of nine (or perhaps, nine on each leg) with a kiai on number nine. Then the next student draws. In a class with older or more advanced students, I’ll let the kids choose the techniques, jumping in only if someone is taking too long to decide. (It’s important to keep things moving!) 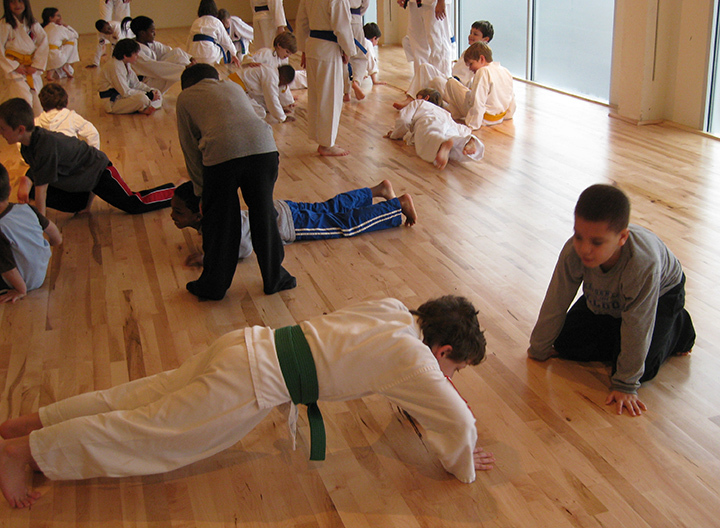 Even with the younger kids, I’ll let them choose for hearts – push-ups, frog jumps, jumping jacks, etc. When clubs are drawn, the technique might be a hand combination (as opposed to a single technique), as appropriate. If the card drawn is a low number, I might make the most of it by tripling the technique done on each count. The possibilities are endless, really. In a good Deck of Cards Class, each student will get to draw twice or more. Even when they don’t get to choose the techniques, they feel a sense of excitement and control when they’re drawing from the deck. It’s fun! Do you use any similar devices to keep things exciting? Please share. I have just become a junior instructor and one thing that I am most unsure about is the ‘mat chat’ for the youngest kids class. What topics and themes should I use? Great question. The easy answer would be, talk about the same things you discuss in the older kids’ classes: respect, etiquette, perseverance, all the martial arts values. But discussions with 4- and 5-year-olds can be a little different. One thing I do with my youngest kids is begin class by choosing a “word of the day,” discussing it a bit, and revisiting it throughout class. These include things like teamwork, fitness, balance, safety, and of course my favorite, respect. Sometimes I talk about the Five A’s of Self Defense: Aware, Alert, Avoid, Anticipate (what?! that’s a really big word! ), and Act. (I might not get through all five in a day.) I try to fish for what the kids know and can contribute, while sharing what I think, what I’d like them to remember, and what it would be great to talk about with their parents. Instructors, what topics do you use with your youngest? And, maybe more importantly, how do you go about discussing them in an age-appropriate way? I’m wondering if any of the instructors out there have worked with blind/visually impaired students. We have been asked if we can teach a six year-old who is blind, and we are exploring the possibilities. I’ve been aware over the years of adult martial artists with visual impairments training successfully in various schools and styles. Working with a 6-year-old would pose different challenges. This inquiry got me wondering how I would handle it. Undoubtedly, there are instructors out there well-trained and experienced with this issue. Any suggestions?